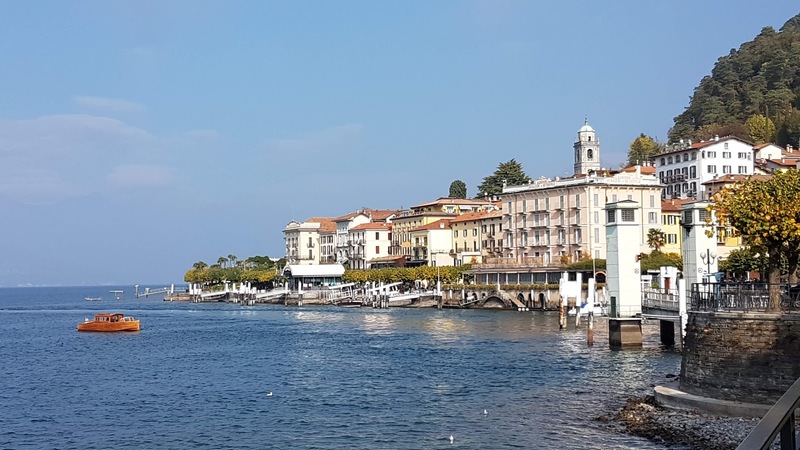 2Wheel Chick: My Tour of Lombardy: Como, Bellagio, Ghisallo, and ooh Sormano! 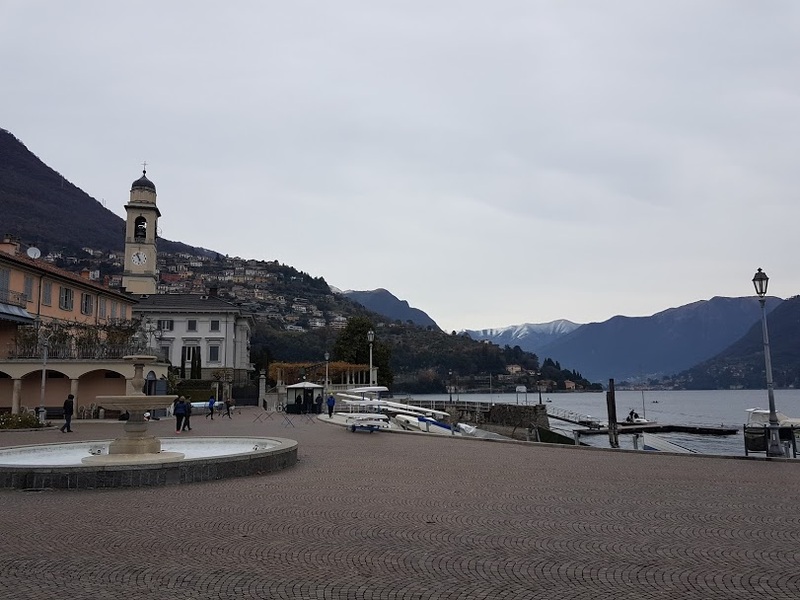 My Tour of Lombardy: Como, Bellagio, Ghisallo, and ooh Sormano! 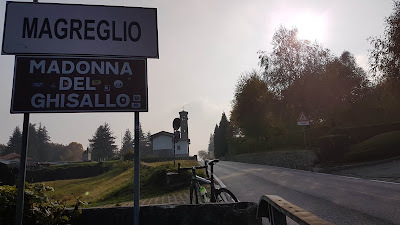 After a day riding in the flatlands of surburban Milan, I then tackled the the hills around Lake Como - specifically Madonna del Ghisallo and the Sormano climbs featured in the Giro di Lombardia. I could have plumped for one of many choices - Brunate, Intelvi, or nearby Switzerland to go up Morbio and around Mendrisio. I was happy to go up the classic climbs as it had been five years since I last rode up these climbs. Also given that the last time I was up there was pre-Strava days I wanted to get this ride onto the app. Yes, I was shamelessly pandering to the saying, "if it's not on Strava it didn't happen!" The drive up to Como was straightforward; parking was not. Como, especially on a sunny Saturday afternoon can get so rammed with locals and tourists that it's impossible to find any free parking in the street. On a previous occasion I drove around alot, even first thing on a Saturday morning. I eventually found a place to park for free - in Brunate, 500m above Como and after 3 miles of rather technical switchbacks! This time I wasn't going to go through all that palava, so I surrendered myself to the paying multistorey car park on Viale Lecco. On cycling out of the car park, very quickly I was climbing as I took the road to Bellagio. It was a picturesque route that went along the side of the lake, with lovely views of Como behind me, with the dome of the cathedral dominating the skyline. Not exactly Como, but nearby Bellagio! This road rose up and down, twisting and turning while passing through small villages like Blevio and Torno. There are lots of places to stop and get a coffee or an ice cream, or even have a full sit-down meal by the lake if you really wanted. The nearby village of Faggeto Lario even had a lido if you fancy a dip. One of these days I will do this route and stop off and have a slap up meal But for today, I had to push on because I had a plan. After around 20 miles I arrived on the edge of Bellagio where a right hand turn took me up the road to start the classic climb up to Magreglio where the Madonna del Ghisallo church is located. At this point I began to see even more cyclists than before on the road. The road up to Madonna del Ghisallo was roughly 10km, so not epic in length, but this was more than made up for in landscape. In short, it's spectacular. 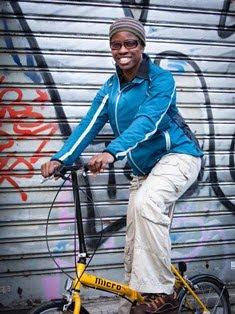 You do have to pedal hard though, and that's the snag - particularly if you've become lardy and sluggish like me! Those initial 3 or 4 kilometres of steep bends were a shock to the system as the gradient kicked up suddenly. I was breathing heavily, and worried how I would get through it as this was only the start of the road. A few guys passed me and grunted words of encouragement as they ground their way uphill. If I wasn't feeling great there was an old boy in a worse state than myself. He was breathing so hard I am sure they could hear him in Como. I was worried he might have been exerting himself too much for his age, especially with the way he was weaving all over the road. As I overtook him I said the customary "Ciao" while trying not to rub it in that I was having less difficulty than him on the climb. Soon the road levelled off and he as well as I found some respite from our efforts. At that point I looked behind to see Bellagio a long way down from where I had come. No wonder I had had to work so hard! A couple of guys who had passed me earlier on the switchbacks were stopped at the side of the road taking photos. This was the last point that we would see Lake Como until 6km farther and 200m higher, at the summit. Then we all tackled the winding road together - well together for 100m after which I and the old boy were dropped. This was a beautiful road that passed through woodland with its lovely autumn colours. It made me look forward to the next day when I was due to take part in a running race on trails through this area. 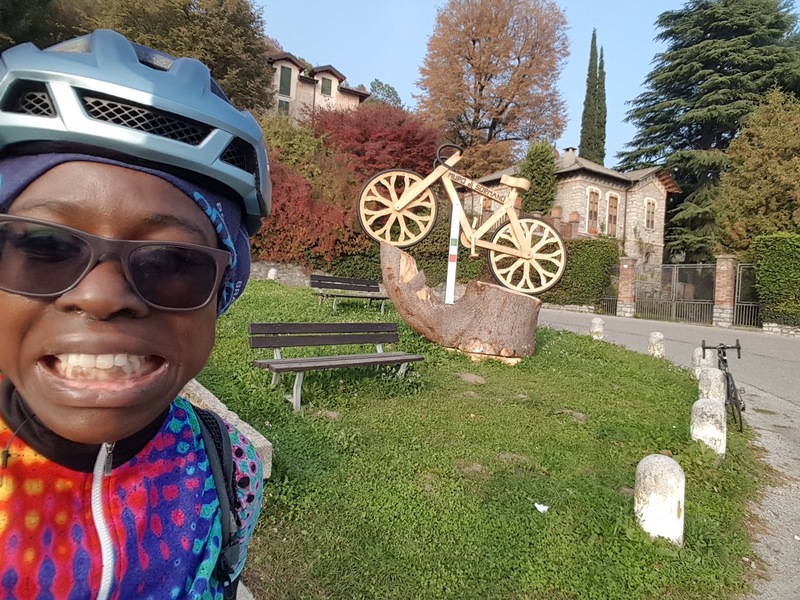 Soon, the road went downhill, passing a village with a pretty chapel and I stopped, thinking that in my reverie I had overshot Madonna del Ghisallo. But when I saw more riders breezing through, and the road going uphill again in the distance I realised I still had a few more kilometres to ride. Once at the summit I heaved a sigh of relief, and felt satisfied that I had managed the climb, and I had even passed a couple of guys. Maybe I wasn't so unfit then. The guys I passed reached the summit shortly after me, and we all congratulated each other and took photos. They were Italians from Turin, who had come to Como for the weekend, specially to ride in this area. It was funny how they were asking me, a Londoner, about the route ahead. They were debating whether to return to Como via Erba, or the infamous Sormano. When I told them they would be climbing the hard side of Sormano their decision was made. They would carry on straight down to Erba. My decision was made too. I would descend a little, turn right and climb to Sormano then look for this Wall. 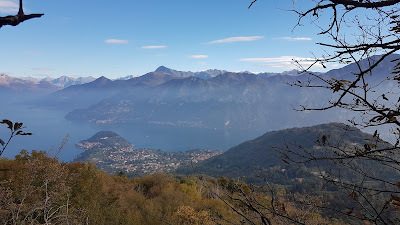 After a look around the chapel with all its cycling memorabilia, and taking more photos of Lake Como I took the fast decent towards Erba, but half-way down turned sharp right to enjoy more uphill switchbacks to reach the village of Sormano. This climb was gentle, and a breeze compared with the effort to reach Magreglio. Again, this was a popular Strava segment as lots of cyclists were on this road in both directions. I also saw some riders who I recognised from the Ghisallo climb. They must have taken an extended café stop at that summit, for they shot past me on the Sormano climb pretty effortlessly. On these types of twisty roads, like on any similar roads in scenic areas the world over, you get plenty of motorcyclists, and this road was no exception. They kept a healthy distance from me though, so it wasn't bothersome. Once I'd passed Sormano the landscape became more unkempt and desolate as it went through scrubland and then woodland. Then I saw the sign for the Muro di Sormano, with its vital statistics laid bare on the ground for all to see. 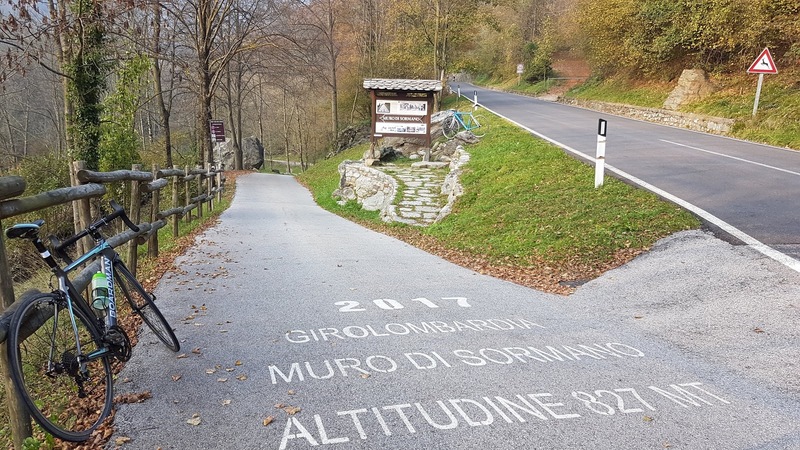 1600m in length, average gradient 17%, maximum gradient 25%, and all the years this climb has been included in the Giro do Lombardia. It was clear that this was going to be tough, and not even the lane that dropped downhill at the start would lure me into a false sense of security. As walkers in the woods saw me coming down the road they all commented in Italian saying words to the effect of "I hope you're ready for this, you will need very strong legs." And they were absolutely right. This climb did not disappoint. The initial section of road shot up just like a wall. I heaved and pushed my way up, my heart pounding, quads burning as I honked out of the saddle; it had me gasping for breath. The gradient must have been a good 22%. It then eased off - only slightly, but enough for me to be able to stay in the saddle and pedal at a snail pace cadence. I must have been moving at barely 2 miles an hour. The road continued along this painful slope, and I could see a bend in the road ahead, and hoped that around the corner things would ease off further. I needed some respite as I was pouring with sweat, and every small lump in the road was too much for me. I was right on the limit and thought I would either melt or combust or both! Alas it wasn't meant to be, and the road continued at its relentless 17% gradient. After about 400m I put a stop to this purgatory on wheels by climbing off my bike and walking. I am just glad that my road cleats were grippy enough to be able to walk, as this road was not even easy to negotiate on foot. I can't think of a harder climb than this in all the riding I've done in Italy. The hard side of Mortirolo is pretty tough, and I had a similar experience on that one, but that was only for a brief stretch, and too be honest I wasn't that fit. I've heard Zoncolan is difficult too, but I have yet to ride that one. After that, I would compare this climb with the comically steep climbs in England, like Hardknott Pass in the Lake District, possibly Winnats Pass in the Peak District, but definitely Wrynose Pass from Ambleside. The only saving grace about the Muro di Sormano is that being a narrow lane, it is traffic free, unlike the comparable climbs in the UK. Time was marching on as I plodded through this forest, and the sun was beginning to set. As much as I was enjoying the scenery which mixed woodland with rock, it was still disconcerting to know when this road was going to finish. I knew I wasn't far from the road but it was nowhere in sight and there I was all alone. None of the riders I had seen earlier were on this road. It seems like they had taken the much easier and sensible option of riding the 5km detour along the very gentle climb that was Colma di Sormano. Maybe I should have done the same, but on all previous occasions that I had cycled this way I had opted for the Colma, and for once I just wanted to try the wall. I made the immediate decision, though, that this would be the last time I ever "ride" along this road! One other rider as crazy as myself was on this road. It was an old boy in civvies and his bike had a dinner plate-sized cassette so he was able to spin up the road for longer than I managed. But even he gave up the ghost two-thirds of the way up. This Muro di Sormano takes no prisoners! Eventually, I heard the sound of people shouting above, and getting in their cars. What a relief that I was getting back into civilisation! Once at the top of the road I looked back and marvelled at how far the road had climbed over the one mile stretch - even if I had only managed to cycle half of it. Given that it was getting late I didn't bother to stop for a coffee. It was just a case of pushing on back to Como. In fact, I didn't have to push at all because from then on it was just one long descent through the Pian del Tivano, and the village of Nesso. Although the ride was effortless, it did require concentration as the switchbacks were very tight and steep. I needed to be mindful of oncoming vehicles as well as the vehicles that I caught up with. Even though Lake Como was close by, there was no sign of it below, and I was constantly riding through wild remote woodland. At one point I wondered if I was on the right road. Eventually the descent took me to the junction with the main road and suddenly the lake reappeared. Phew, I was on the home run. It was just a 15km ride back to Como where I celebrated with an ice cream. It had felt like a long afternoon, but that was more because the hillwalking experience I'd done mid-ride. I would definitely recommend this loop, though it's not necessary to do the hard option that I went for. 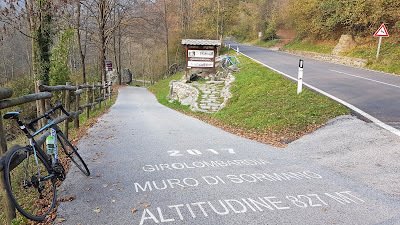 You don't have to ride the Muro di Sormano. The Colma is pretty doable. 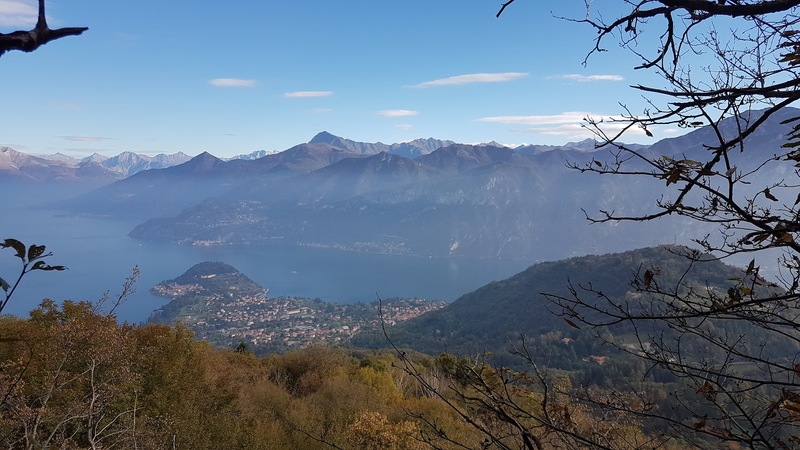 It is possible to leave out Sormano and drop straight down to Erba, Ponte Lambro and then a gently undulating road followed by a fast descent into Como. If you do go for the more testing loop, use a bike that has the biggest dinner-plate gears you can find, otherwise wear shoes that you can walk in!